Nutrition labels are the worst: they're impossible to decipher, they assume everyone's eating 2000 calories, and the ingredients are all Manganese to you. Wait, that's actually an ingredient? For an easier breakdown of recommended gorging, hit ShopWell. Making it frighteningly easy to eat better, Shop'll swiftly match you with food that's best suited to your particular dietary preferences, goals, and restrictions, which until you start buying what it recommends will continue to reside mostly in your arteries. 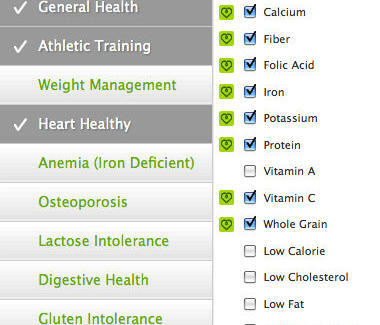 The first step's checking off boxes to identify specific ingredients you want in your diet and those you'd like to avoid, which can be auto-populated using general "goals", e.g., Athletic Training triggers protein, iron, folic acid, etc, while Heart Healthy knocks off various fats, corn syrup, and refined grains (advantage: oat couture). 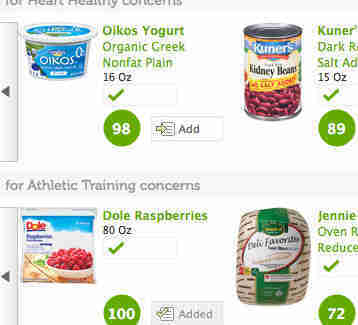 Once filled out, they'll shoot back name-brand foodstuffs scored from 0-100 based on how they match up with your aims, supplying exact nutritional deets and recs for similar foodstuffs better suited to you; opt to manually search their ginormous archive by category (chips, soup, etc.) and the best results will rise to the top like cream, only in this case there definitely won't be any. Since writing out grocery lists is for the birds...who have mastered penmanship, you can click to add items and curate as many lists as you want, though you'll end up with the only thing worse than reading: shopping.